Protease contamination even in a trace amount can degrade proteins or peptides during purification, storage or crystallization. Protein or peptide drugs should be protease-free. Proteases are also important drug targets. The Ultra-sensitive High-throughput Protease Assay Kit is useful to detect protease contamination of various protein preparations and to screen protease inhibitors in a 96-well or 384-weel plate assay format. The assay is based on the principle that digestion of the fluorescence-labeled protein substrate results in dramatic increase of the fluorescence signal. 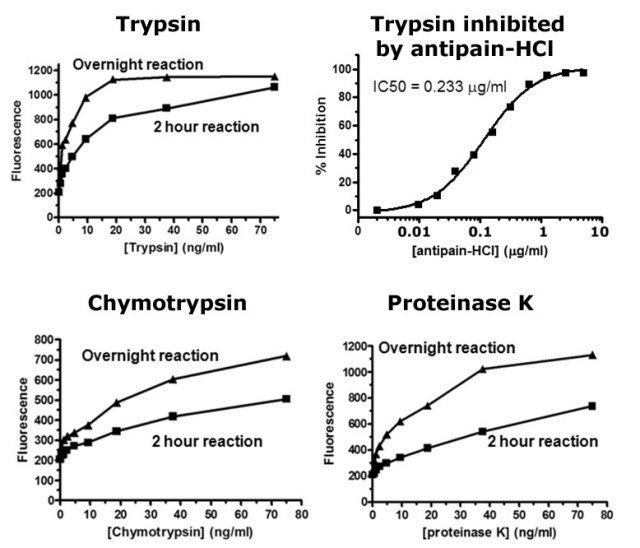 The sensitivity of the assay of trypsin, chymotrypsin and proteinase K is below 5 ng/ml or 0.2 ng per assay well for the standard 384-well plate assay. Each kit (Catalog number UPA1000) includes the 5 ml of 10 x assay buffer and 50 ul of 1000 x substrate for 1000 assays of proteases in a 384-well plate format.